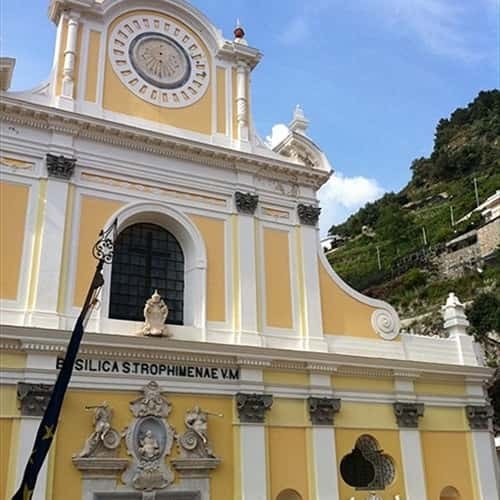 The church of Minori reaches up with strenght from the darkness of history around middle of the XI century and for over thousand years has given splendour and honour to this town and to the entire Amalfi coast. In 987, when Minori was assigned bishop's see, the town lived the most important of its already centuries-old life. The ancient Reghinna Minor, according to the tradition, houses the relics of the Sicilian Martyr from 640 AD. The choice of Minori as a Bishop's see is certainly linked to the presence of the relics of the Virgin and Martyr St. Trofimena, patron Saint of the town and protomartyr of the entire Amalfi coast. In 1747 began the works of the new church, works which ended at the beginning of the following century. The result is the actual Neoclassical style building, Latin cross shaped, with its imposing facade towrds the sea and the inside on three naves; a basilica characterised by the simple decorative lines and its architectural magnificence.